(Informed Comment) – As the world is marking the end of the First World War first centenary and remembering its millions of military and civilian victims, in this article I’m going to focus only on one victim of the Great War and that’s the truth. There are millions of forgotten Arab and Muslim soldiers who fought with the Allies but unlike their European and other Western comrades in arms, they did not get the recognition they deserve and their stories were buried with them. Egypt, the biggest Arab country which was under British rule contributed with 1.2 million conscripts who served with the British army in different roles. At that time this would have been about 10 percent of Egypt’s entire population. France which colonised several Arab countries in North Africa conscripted 170000 Algerians to go and fight for the country that occupied their homeland for 132 years and killed more than 1 million Algerians. France also conscripted 80000 Tunisians and about 45000 Moroccans to join its war effort which brought the total of Arab men who fought with the Allies to almost 1.5 million. A similar number of conscripts came from pre-partition India when it was under British rule. Indian soldiers were Hindus, Sikhs and Muslims. 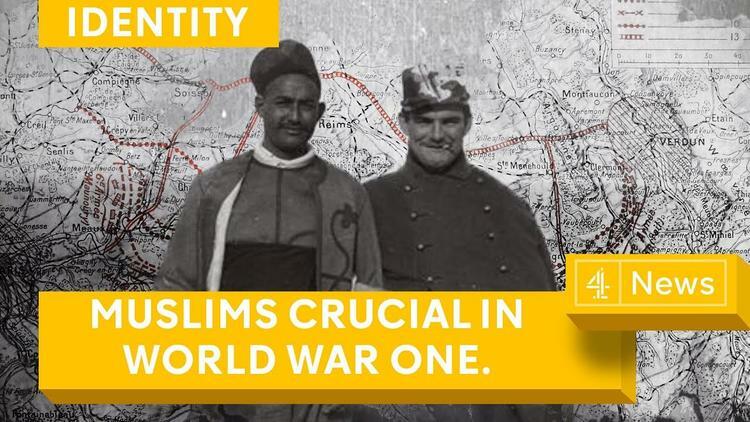 Other researchers, however, estimate that 2.5 million Muslims fought with the Allies including 1.3 million Russian Muslims and 400000 other Muslims of the Indian subcontinent. Other Muslims including labourers who came from China, sub-Sahara Africa, Libya, Somalia and America. Considering the different figures presented by different researchers and historians, the number would have been well above 3 million forgotten Muslims. Aljazeera produced a three part documentary on these contributions. Despite evidence of cases of discrimination against Muslim soldiers, they were loyal and brave fighters but unlike the troops who came from Australia and New Zeland who are well recognised by Western governments and the media, Muslim soldiers rarely get mentioned let alone commemorated. There are however, non-governmental initiatives to recognise their contribution and the sacrifice they made. An inspiring work in this field has been done by Luc Ferrier after he found the diaries of his Belgian great grandfather who fought alongside Muslim soldiers. After reading the diaries, Mr Ferrier said “I was impressed by the enormous respect he had for his Muslim brothers in arms from all these continents, while he himself was a very devout Christian.” This led him to leave his full time job and to dedicate his life to highlight the importance of the contribution made by Muslim soldiers and founded the Forgotten Heroes 14-19 Foundation. He believes that without their contribution, the Allies wouldn’t have been able to win the Great War. Such initiatives have unearthed inspiring stories of Muslim soldiers sharing their food with hungry civilians. More stories are also emerging of French, Belgian and Canadian officers impressed by how the Muslim soldiers treated the German prisoners humanely according to the teachings of their faith. There is no exact figures for how many Muslims died but surely there was an immense loss of lives amongst them. For example, the death rate amongst Moroccan soldiers was 26 percent compared with 24 percent for French soldiers as the Moroccans were sent to face the Germans first. Algerian troops were amongst the first who were gassed by Germany. It is also estimated that half a million Egyptians never made it home. Britain, however, never lived to its promise of granting independence to the Arabs after the war, instead, in 1916 it secretly signed the Sykes-Picot agreement with France to partition Greater Syria into the four different countries of Syria, Lebanon, Jordan and Palestine and to colonize them. It followed that with a promise to create a Jewish state in Palestine a year later through the Balfour Declaration which condemned the region to endless wars and bloodshed that haven’t stopped. France continued to occupy North African Arab countries and carried out nuclear experiments on Algerian civilians after the Second World War which resulted in more death and suffering. It is important that these historic facts are recognised in order to counter Islamophobia and the rise of the far right which portrays Muslims as the enemy within while the fact is that Muslims fought and died to defend the West. In order to achieve that, however, mainstream political leaders and the media need to start the process by acknowledging the role played by Muslims and others in defending the freedom of the West. It will also be helpful if they stop playing into the hands of the far right by talking about Muslims as a menace. Other initiatives like commemorating plaques and including the topic in schools history curriculum would be another way to honour the deserving heroes. There is a long way to go but it has to start somewhere. Mohammed Samaana , a freelance journalist published in the Belfast Telegraph, is originally from Palestine and lives in East Belfast.